A stunning iteration of our Astor Nightstands by Montage featuring sleek nickel-plated hardware and introducing a new finish: Oak in Washed Gray. Astor is among many pieces in the Montage Studio Collection, designed with the Mid-Century in mind embodying delicate proportions and bold use of the highest quality materials. Every piece made by Montage in our Studio receives skilled workmanship from multiple artisans. Our carpenters hand craft each casing from Oak then finish them to perfection in a stunning Washed Gray. The piece is designed to stand alone in a room as every side, even the bottom, is finished and attractive at any angle. The maple drawers are milled and dovetailed which ensures longevity and long lasting durability. 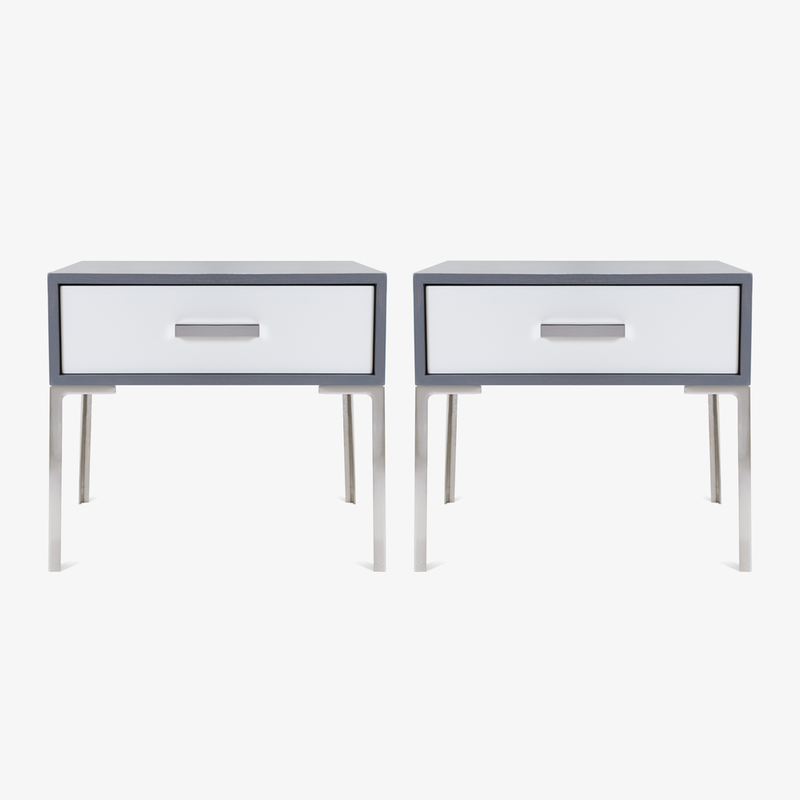 To finish off the design the drawer is faced with a bold lacquer in Ivory, creating a contrast against the Washed Gray casing; the perfect marriage. The other design element that defines the Astor Collection is its hardware. Solid brass minimalist design and in this instance, elegantly nickel-plated. Our hand crafted wood casings are mounted on modernist cast brass legs, a contemporary take on Mid-Century Italian design. Lastly a solid brass bar-pull is mounted to the drawer face again contrasting with the Ivory. Nickel was a necessary step in achieving a harmonic balance of materiality with our new Washed Gray finish; the result couldn't be better. Every piece in the Montage Studio Collection is handmade to-order in our Connecticut Studio, ensuring excellence in quality with each order. Every inch of the collection is customizable: dimensions, wood finishes, metal finishes; every detail can be tailored for your project. Contact Montage to request samples of our finishes or yours, discuss trade and contract pricing, or to work together on a one-of-a-kind gem for your project.